* First, people wanted to know what the title of the novel is. Right now, it doesn’t have one. It has a working title, but it’s spoiler-y for the story, so I don’t want to say what it is. I’m thinking on various titles and will probably settle on one in short order. When I do, I’ll let you know. * For those hoping for a new Old Man’s War/Android’s Dream/God Engines installment, sorry. This novel takes place in none of those universes. New universe, new characters, new situations. * That said, I suspect that if you like the stuff I generally write, you’re going to like this. In sensibility — not in subject — I think it slots in between Agent to the Stars and The Android’s Dream, which means its on the lighter end of the spectrum of what I write. Why? Because I felt like writing something fun and pulpy, that’s why. I had fun writing it, and I think people will have fun reading it. * I’m being intentionally cagey about subject matter because, like the working title, discussing it too much will spoil the story. I will say that the story does feature space ships, an ensemble cast, lots of action, snappy dialogue, explosions, imminent death, and people taking other people’s pants for strategic purposes. I’ll also say it’s a bit of an odd story, and written intentionally to be so. But then, considering that I’ve written about farting people to death and aliens taking over the bodies of dogs, I have to stipulate that “odd” might be my normal mode. * Yes, yes, yes, you say. You don’t want to spoil it for us. Fine, just tell us when it will be out. Answer: Dunno. It wasn’t under contract, so now I have to sell it. Before you worry about me not having a contract, I should note that I haven’t written a novel that was contracted in advance since The Last Colony; Zoe’s Tale was not technically under contract (I wrote it, and then when it was done it was slotted in to take the place of a different book I was contracted for but didn’t write) and Fuzzy Nation was contracted after it was done. So this is not an unusual position for me to be in. And, you know. I feel pretty confident. 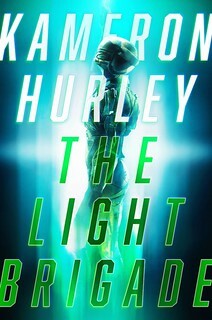 My expectation is that this will be out, one way or another, sometime in 2012. * Why 2012? Because book production takes time, and also, I already have a novel for 2011 and I don’t want to step on its sales. Don’t worry, folks. Between now and whenever this novel is released, I’ll have other stuff out there for you to read and maybe even buy. Because I love you. Yes I do. And also, I want your money. Yes I do. * For the folks who like to indulge in process geekery, I started writing this novel on January 3rd and completed it on March 7th, for a total writing time of nine weeks. Most of you know by now that my plan was to write to a quota every week day (2,000 words) or until about noon. My real world performance on this was good but not great, in large part due to Snowpocalypse ’11, which caused my daughter to miss nearly two weeks of school because of snow days. Having Athena home is lovely in many ways but not conducive to having an extended, uninterrupted stretch of time in which to write. I also had some travel in there, most notably to Capricon, which was again delightful but not best for getting writing done. That said, on the days when I was not being actively encouraged to abandon the computer for sledding, or traveling to distant cities to amuse nerds with my antic capers, I got a lot of writing done. Go me. * For those wondering about next plans, I’m going to take a little bit of time to relax, and then in about a week I’ll get back to writing more fiction. I have an immense amount of travel this year starting in April, so if I want to get fiction done, now’s the time to do it. Speaking for myself: Yay! That’s not a complaint against the OMW universe. I enjoyed it, and certainly wouldn’t mind seeing more stories set in that universe. But I like it even more when writers I enjoy reading do something entirely new. I feel like I know John and Jane and Zoe pretty well by now. Given a choice, I’d rather read about new characters and new worlds. Looks like I’ll get to do that. Like That Neil Guy, I’d also like to see a “Scalzi’s writing process” post. For example, when you say “done” do you mean “ready to send out to first readers” or “back from first readers?” Or do you just skip the whole “first reader” phase, and send directly to an editor? Yes, per That Neil Guy, please. Also: Congratulations! And, regarding, “I will say that the story does feature space ships, an ensemble cast, lots of action, snappy dialogue, explosions, imminent death, and people taking other people’s pants for strategic purposes. I’ll also say it’s a bit of an odd story, and written intentionally to be so.” Please send me an ARC asap please, or better yet, just shoot me the file! Right now! So I can study it! And steal it! Seriously, I am looking forward to a smart writer aiming for those “high-notes” and pulling it off. Sounds good. Congrats, Scalzi. So the title itself is spoiler-y? Is it “Snakes on a Spaceship”? Sweet! Happy to have new Scalzi novels this year and next. And new universes, to boot. I’m a (big) fan of the OMW books, and Android’s Dream was lovely (still hoping for that sequel at some point, if you can solve the issues you were having), but it’s always nice to have new worlds to read about. +1 on a process post – those are always fascinating. Congrats on the new novel. John, I like all the posts that mention that you leave work behind when you need to go play in the snow with your daughter. Priorities, after all. You’re a good man. I’m so excited! Don’t get me wrong, I enjoyed Old Man’s War, but I liked Android’s Dream better and now I can’t wait for this one. And strategic pants-stealing?! Oh yay! Thanks for the tidbits you could share. I revise as I go along, so generally speaking when I’m done it’s ready to send out to the editor. Excellent! I loved The Android’s Dream and Agent to the Stars, so a book pitched between the two in terms of tone and sensibility should be right in my sweet spot. So, goal of 2,000 words a day (presumably weekdays only?) x 5 days a week = 10,000 words a week, x 9 weeks = 90,000 words, minus unspecifically specified snow and travel days = ? Do you have an approximate word count? And as a fan of strategic pants-stealing, have you seen 49th Parallel? Awesome news! Since you aren’t under contract, why don’t you self publish as an ebook? I’d buy it right now, and I’m sure most others here would as well. Why delay the payment? Because ebooks are currently 5% of the science fiction market, I don’t want to have to pay editors, copy editors, cover artists and page designers, not to mention paying for publicity and marketing, because I’m sure as hell not going to do all that myself, and if I self-publish I won’t sell any foreign rights to speak of. Dear Mr. Whatever Guy: Could you automatically repost the following every 30 days or so: “Is it 2012 yet? 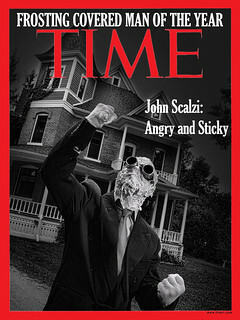 I want the new Scalzi novel nooooooooooow!” Thanks! Would self-publishing it as an ebook also (potentially) irritate publishers who didn’t get a chance to sell it and with whom you might like to work in the future? Or does that question just show a staggering lack of knowledge about the Way The World Works? Remember folks, there is a new novel between now and the one I just wrote. No, I don’t suspect they’d care. What about a contest? Let your loyal (slavering) fans suggest a title sight-unseen. The best reader-suggested title based wins an ARC. I’ll admit that my first thoughts were in line with those of Tom L. but not as an ebook, at least in a proprietary format (since I knew those were a small part of the market). But would self-publishing as a pdf be significantly different (and no, I’m not trying to tell you your job, just curious). I would guess (with emphasis on that word) that copy editors, cover artists, and page designers could then be largely dispensed with. At least I don’t care about most of the above when I read sample chapters from an author online (don’t know how that translates to other folks though). Well, at least cover artists and page designers as it’s probably in a readable format already. I’ve always wondered about foreign rights also; what percentage of a books earnings typically (well, in your knowledge of “typically”) comes from those? Can an author’s earning be signficant if a translation is done (and paid for by a foreign publisher)? If one just scales by the English speaking population of the world, foreign sales could probably increase the total by up to a max of perhaps 50%, roughly (for a book originally published in the States). Then there’s the matter of publicity. Any idea how a book tour increases your sales? You and your publishers certainly have to think they’re worth it to put in all the time and effort but I suspect there might be a point where that’s no longer true and things like blogs and personal apperances are more effective. This all seems as if it’s a reasonably complex optimisation problem, with parameters that are probably time dependent also. I’m confident that you’ve thought of all this (and probably much more) in a serious manner, but I’d be a little surprised if that’s true of most authors. 2012? But that’s when the world is going to end! D’oh! I assume you and your agent will do their best to get it into the shops before the long calendar runs out? diogenes: I would guess (with emphasis on that word) that copy editors, cover artists, and page designers could then be largely dispensed with. Oh, boy. No. This has been thrashed out over and over again at Making Light (http://nielsenhayden.com/makinglight/archives/012164.html for example), and also at Charlie Stross's site (http://www.antipope.org/charlie/blog-static/2010/05/cmap-9-ebooks.html) among others. Basically, if those functions are dispensed with then the author has to take them on or hire them out, which means that they're either making less or are spending time on those functions instead of writing new material for you to read. @#19: What’s the difference between “book tour” and “personal appearances?” Except for the SF market with its network of conventions, personal appearances = book tour. And sometimes even then, when book tours planned and paid for by the publisher roll in many conference appearances. In general, book tours are not a worthwhile use of marketing dollars except in the case of very very “big” books for the publisher. Perhaps one author in 500 is sent on one. Most authors do a few local appearances or signings, and sometimes not even that, dependent on genre. Regarding foreign rights, it’s really dependent on the book. My foreign sales have made up everything from 3% of my domestic sales to 150%. I have writer friends whose foreign markets form the bulk of their sales, who write books SOLELY for translation into foreign markets, and who have written books solely for translation in foreign markets that, years later, got picked up by a US publisher. However, for a self published book to sell in a foreign market, it has to be a REALLY big seller here. Self published authors DO hire their own line editors and copyeditors and book designers, or they risk extreme criticism. People wan to pay for professionally edited work. You have a typo in your book, and you get angry letters about it. And all authors think about these things. Every author I know obsesses about the best use of marketing dollars and how to make a living. I caught the clues you left in your messages about this forthcoming novel. And the fact that you wrote it just a couple of months after the announced cancellation of SGU can only lead to one conclusion. Obviously this is the novel which will tie up all the loose ends of the Stargate: Universe saga. Unless I ‘m wrong, in which case I’m sure I’ll enjoy whatever it really is.